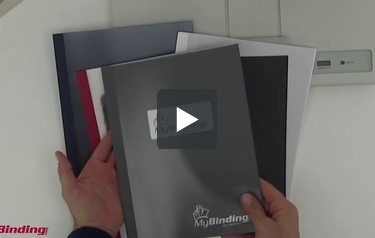 Welcome to MyBinding video. This video looks at CoverBind’s Classic Advantage Thermal Covers. Classic Advantage Covers are a great look for your presentations with a built in glue strip right into the spine, all the work does itself in the thermal binding machine. They have a beautiful, transparent, non-glare frost front cover that allows the title page of your report to show through and keeps it nice and safe. With frost covers, they can be the cover to the report itself or just a nice, scratch resistant overlay on your own personal-made cover. The classic advantage series feature a back and spine made from heavy duty, 100 pound linen paper. This video features some of the most popular colors; however we have plenty more for different kinds of occasions and they all work in any of the CoverBind thermal binding systems. That’s it, that’s CoverBind’s, Classic Advantage Thermal Covers. For more demos, reviews and how to’s, check out MyBinding.com.